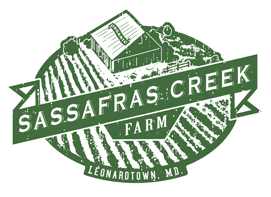 Where is Sassafras Creek Farm located? Our farm is just 10 minutes from downtown Leonardtown, Maryland located in St. Mary's County. - California (BAE) Farmer's Market every Saturday (April through November); No on-farm sales please! Please sign-up for our e-mail for exact dates and additional details. What is e-mail sign-up? Each Friday evening we send a brief e-mail telling you exactly what we'll be offering at the farmer's market on Saturday. This helps our customers prepare their food shopping list and take the guess work out of what will be available from our stand. We also will feature a vegetable and include a suggested recipe or two. Do you sell directly from your farm? At this time we only sell locally at the California farmers' market, The Good Earth and Chesapeake's Bounty - we're too busy with our small crew growing and harvesting vegetables. Do you sell to restaurants? Yes! We are continually interested in working with chefs who have a passion for featuring local and seasonal produce from Southern MD. Please contact us for additional details. Do you offer a Community Supported Agriculture (CSA)? Many customers have asked us to start a CSA service. We are interested in doing so as we believe it's a great way to better connect community-to-farm and to locally grown food. We'll be sure to keep you updated and we look forward to adding this next chapter to the farm. How do I prepare (a particular) vegetable? We're glad you asked! Please see our Cooking & Storage menu tab and feel free to ask us at the farmers' market. Do you offer farm visits? We like sharing our passion for small sustainable farming and do farm visits as our schedules permit. Please e-mail us. Do you have any job openings? Yes! We are always interesting in helping employ people who have a desire to learn sustainable farming, especially here in southern Maryland. Please see the "Opportunities" menu on our Homepage for current openings. (3) Be the change. David and Jennifer saw market farming as an opportunity to be self-employed, enjoy the camaraderie of like-minded farmers and help promote small farms in Southern Maryland and contribute to a healthier more sustainable local food system. What is "sustainable" farming and marketing? Sustainable farming foremost nurtures the land rather than deplete it. It is part of an "alternative" agricultural movement that promotes the use of biological interactions and cultural practices in place of agricultural chemicals. The goal is of this movement is a productive and profitable agriculture that protects natural resources and builds strong communities. What is local food? Local food to us means producing food from our local landscape for our local community. See how a community in Vermont takes local to a whole new level, Dan Rather Reports. What does Certified Organic mean and why is that important to you? Organic farming is a form of agriculture that relies on techniques such as crop rotation, green manure, compost and biological pest control rather than synthetic chemical or genetically engineered control. Organic farming uses natural fertilizers and pesticides but excludes the use of manufactured synthetic fertilizers, pesticides, (which include herbicides, insecticides and fungicides), plant growth regulators such as hormones, livestock antibiotics, food additives, genetically modified organisms, and human sewage sludge. Certified Organic means being fully transparent. Our vegetables, herbs and fruit are grown following strict rules set by the USDA (Code of Federal Regulations, Title 7, Part 205). Our entire farming operation, from seed purchase to consumer sales, undergoes a rigorous annual audit of our crop planting & harvest records, our financial documents and an extensive on-farm inspection by a USDA-accredited third party certifier to insure compliance. QCS, Inc is our organic certifier. We selected QCS because they are recognized leaders in the organic certification field and sticklers for attention to detail - a good thing. Aside from the transparency, growing organically means using a holistic approach that promotes and sustains the health of our farm's soil and environment indefinitely without depending on or using chemically-intensive agricultural practices. It also means recognizing that our farm is part of a larger local ecosystem that we have limited control over and thereby choosing to work with nature rather than against it. We also think organic growing represents good environmental stewardship; and that is very important to us. Our experience. Long before we started growing for market, we always had a bountiful vegetable garden for ourselves, using only organic growing methods. That is to say, we grew vegetables like our (great) grandparents did, without the use of "modern" chemicals. Through our 18 years of combined growing experience, we have seen that healthy soils make for healthy plants that grow delicious vegetables, without the need for genetically engineered seeds or environmentally harmful synthetic insecticides, herbicides and fertilizers. On our farm, we grow acres of soil enriching cover crops and deliberately plant habitat for beneficial insects to help keep the destructive insects in check. For us, becoming certified organic was a natural fit, since we can't imagine growing any other way. Why do you grow cover crops? We grow cover crops to improve our crop yields. Cover crops make use of the natural ecological processes to improve soil. Cover crops restore soil structure, recycle natural nutrients, and retain water in the soil. Building healthy, naturally functioning soil takes a lot of time and commitment, but we think it's worth it and we believe you'll agree.